At the DFW Center for Spinal Disorders, we treat a varying degree of spine related issues, including Spinal Stenosis. Although some may not experience any symptoms, spinal stenosis is known to leave many with pain to the neck, arms, or back. At our DFW locations, our board certified spine surgeons will sit with you and asses your symptoms to provide the best treatment plans available. Spinal stenosis is a narrowing of the spinal canal or the foramen, the opening through which nerve roots pass. Stenosis can develop in any area of the spine. Cervical spinal stenosis is the narrowing of the spinal canal in the neck. The spinal canal can squeeze and compress the nerve roots where they leave the spinal cord which or it may compress the spinal cord itself. Squeezing the nerves and cord in the cervical spine can change how the spinal cord functions. The spinal cord is the nerves that allow us to feel, move, and control the bowel and bladder as well as other body functions. Lumbar spinal stenosis is when the spinal nerves in the lower back are compressed, which often leads to leg pain and other symptoms. Medications, physical therapy or spinal cortisone injections are all options for pain relief. Surgery is an option for those who do not improve. During this procedure, the removal of both the spinous process and lamina help to decrease pressure on the spinal cord. Instrumentation can be used to ensure stability. Often times, in addition to decompression, your surgeon will perform an instrumented posterolateral fusion by inserting a series of screws and rods coupled with the placement of a bone graft. This fusion provides increased spinal stability. The surgical approach is from the front of the abdomen. 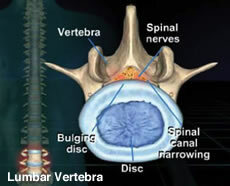 Once the exposure is made, the disc material causing the nerve compression is removed. After removal, an interbody cage or bone spacer is placed at the disc site filled with bone graft. The vertebral bodies above and below are frequently put under compression to aid in the subsequent spinal fusion. What Happens if Spinal Stenosis is Left Untreated? If you suffer from Spinal Stenosis, contact our office today at (817) 916-4685 to schedule a consultation with out of our board-certified spine surgeons. Our practice serves Arlington, Irving, Dallas, Fort Worth, Las Colinas and surrounding areas in Texas.